Longtime Tennessee Lady Vols beat writer and author Maria M. Cornelius provides her annual in-depth preview of the team, from freshmen to seniors, by answering our questions. Who is most poised to step up and fill the shoes of Mercedes Russell and Jaime Nared? Those are big shoes to fill, since Mercedes Russell and Jaime Nared started every game and were Tennessee’s leading scorers. 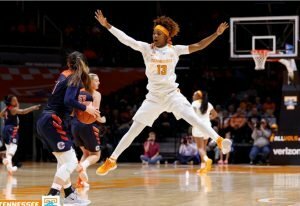 The post position will be covered by committee this season and, fortunately, the Lady Vols have several options. Cheridene Green. Photo courtesy of Tennessee Athletics. Cheridene Green, the 6-3 juco transfer by way of London, England, had an excellent off-season. She got noticeably stronger, and she is finally healthy. Green missed the 2016-17 season to recover from ACL surgery (the Lady Vols signed Green out of Asa College in Brooklyn, N.Y., knowing she would need the knee operation) and was still getting her bearings in 2017-18 after a year away from the court. Through the first three games in the 2018-19 season, Green is averaging 10 points and 6.7 boards. Kasi Kushkituah also has moved into the starting lineup after seeing action in 16 games last season as a newcomer. The 6-4 sophomore has averaged nine points and four boards over three games to start this year. 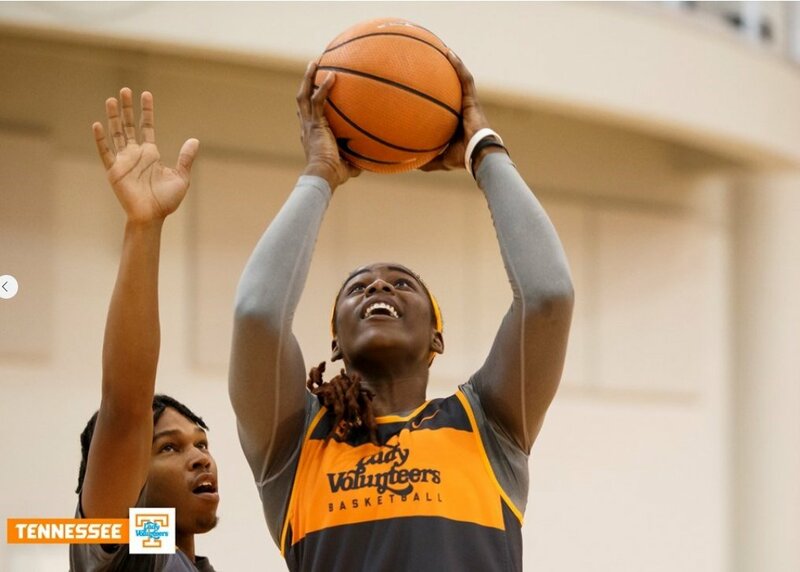 She also focused on conditioning in the summer to be ready for the Lady Vols’ up-tempo attack on offense and full court pressure on defense – a style of play Tennessee prefers, but did not have the depth to deploy last season. Nared and Russell often played the roles of ironwomen by going the distance – or very close to it – in games. Help this season also comes from the bench in Kamera Harris, a 6-3 junior, and Mimi Collins, a 6-3 freshman. Harris got in excellent condition over the off-season, and Collins has a high motor and will relentlessly pursue the glass. The Lady Vols had hoped to have Lou Brown, the 6-3 graduate transfer from Washington State, but the native of Australia tore her ACL in October and will miss the season. 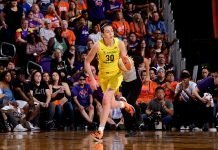 Brown would have competed to start this season because of her experience, high basketball IQ and ability to shoot threes from the power forward position. Brown will apply for a sixth year of eligibility with an eye on playing for Tennessee in 2019-20. Green and Brown are the Lady Vols first international players, but Brown’s injury means they won’t get to play together at Tennessee. Russell and Nared are missed – and will be missed going forward, especially in SEC play where the paint is a brawl. But Green, Kushkituah and Harris have improved, and Collins doesn’t compete like a freshman. It will be post by committee – and Rennia Davis, a 6-2 sophomore, can slip inside to help, too – but the pieces are solid and capable. This team is very young. How is that going to work when they step onto the floor? The coaches, writers and fans will get a much better idea of how the youngsters will react going forward. Tennessee takes on Clemson – which is playing tough under new coach Amanda Butler, who is no stranger to the SEC after her years at Florida – on Thanksgiving Day, and will then face either UAB or Oklahoma in the Junkanoo Jam in the Bahamas. Before the Christmas holiday break, the Lady Vols also will play on the road at Oklahoma State and Texas, and they will host Stanford. The first three games were in Knoxville before home crowds delighted to get a look at the newcomers. Tennessee handled Presbyterian, UNC Asheville and Florida A&M with ease, which was expected with over-matched opponents. The scoring margin averaged 46.7 points, with rebounding margin at 18.7 boards, and the three opponents averaged 30.2 turnovers. Kamera Harris. Photo courtesy of Tennessee Athletics. So, what can be taken from those three games? The freshmen have high motors and play hard. Coach Holly Warlick often used a five-for-five substitution pattern, replacing the starters with four freshmen and Kamera Harris. Neither the style of play nor lead slipped despite the youth on the court. Warlick and her staff have repeatedly said they don’t have to coach effort with this group. The newcomers are talented but coachable, and that is by design, as Tennessee recruited the Class of 2018 with chemistry in mind. College basketball players spend an inordinate amount of time together on the court, at practice, inside the locker room, on airplane and bus trips, at their campus dorm suites, in the weight room and at overlapping classes and study hall sessions. With a dozen or so players on a roster, team chemistry is a factor in success – and a tense environment can torpedo a team. The coaches looked for high school players who were low maintenance, team-oriented and hard workers. All four members of the Class of 2018 fit that description. For example, Jazmine Massengill a guard from Chattanooga, Tennessee, told the coaches a year ago to not worry about her home visit until after scheduling the other high school seniors who had not committed yet. Massengill’s commitment was firm, and a home visit with the coaches on her end was flexible. 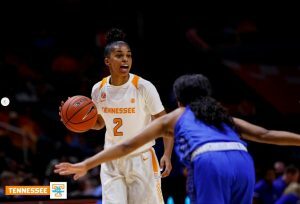 Mimi Collins committed to Tennessee in early December 2017 and then proceeded to have a monster high school season, including being among the final five for Naismith player of the year. Other schools came calling, but Collins’ commitment also was unwavering. When she realized her high school class in Maryland would not graduate in time for her to enroll at Tennessee in June, Collins arranged to take her final exams early and complete her high school requirements in time to join the other freshmen in Knoxville for the first session of summer school. Warlick has said it is a joy to coach this team. It’s been easy to see why. Lou Brown was taking a leadership role before she got injured. Is she still active on the bench? Lou Brown said after her injury that she would do all she could to help the team this season from the bench. 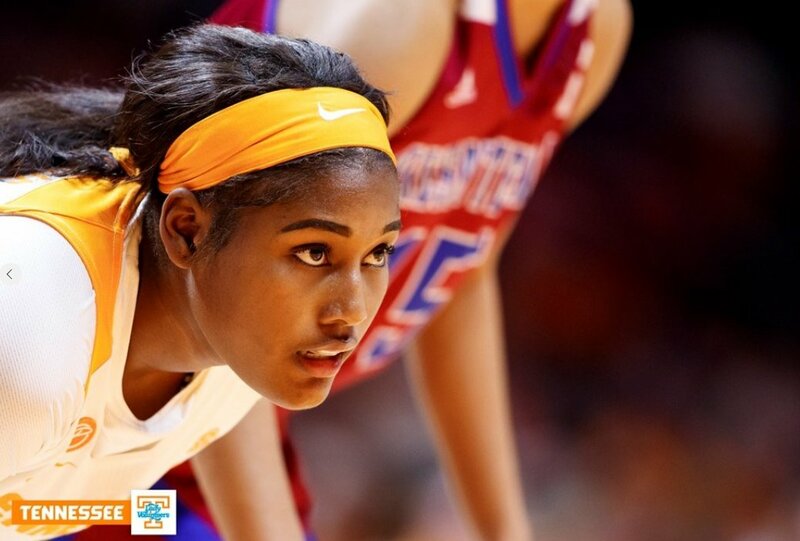 Her immediate decision to ask the NCAA for a sixth year also signals her commitment to Tennessee and the team. Brown’s arrival from Australia (she went home after graduating from Washington State for the first time in two years to complete an internship to get her college degree) was delayed by visa issues, and she didn’t arrive in Knoxville until after Labor Day. The non-contact injury occurred a few weeks later in practice while she was getting back down court. Brown has been on the bench since the injury, and she made the trip with the team to the Bahamas. Her teammates embraced her quickly when she arrived in September, and she has been active on the bench. Hopefully, her appeal is successful. Brown will be a boost to Tennessee when she can take the court because of her three-point shooting ability and upbeat attitude. Rennia Davis returned improved and motivated. What other returners look like they’ve taken some steps forward? Evina Westbrook overhauled her shot and got healthy in the off-season. A leg injury early in SEC play hindered her for the second half of the 2017-18 season and limited her practice time and game minutes. Westbrook didn’t physically play the same way, and the injury affected her mental outlook, too. The 6-0 guard looks like her pre-injury self now. Evina Westbrook. Photo courtesy of Tennessee Athletics. Westbrook has emerged as a team leader, along with Green – who the team calls “London” – and settles the team offensively at the point position. It can be easy to forget that she is just a sophomore – along with Rennia Davis – because so much is expected of the two second-year players. Westbrook has 17 assists in the first three games, while Davis is the team’s leading rebounder at 9.5 boards per game. Meme Jackson also has stepped up as a leader and leads the team in scoring so far at 14.3 points per game. The senior Jackson can get a rhythm from the arc and has the athleticism to be a stopper on defense. She leads the team with 12 steals. Harris had her best off-season since she arrived on campus and has the ability, along with Green and Kushkituah, to set screens to get shooters open. If the stat sheet included screen assists, those three would be at the top of the list for Tennessee. Coach Holly Warlick has said the freshmen group is one of the most competitive she’s been around. What does she mean by that? Three reasons. First, this group loves the game of basketball. All four got to Tennessee in June and stayed all summer. Second, they get in the gym without being told. Third, they compete in practice and games. In the practice drills I have seen, all four get after it. Pat Summitt would like this group – and that is high praise. In the exhibition game, the freshmen acknowledged that they were nervous at first, but then they settled down and played. The three games at home allowed the coaches to get a lot of minutes and, more importantly, teaching film. While competitive and driven, the freshmen also are very coachable. They listen to the returning players, but they don’t just defer. They also listen to the coaches. It is a class that was recruited by every coach on the staff in Warlick, Dean Lockwood, Sharrona Reaves and Bridgette Gordon. When Gordon arrived in August of 2017, the class of 2017 was already on campus. Gordon is now in her second year and was instrumental in the recruitment of the 2018 class, and the class that will arrive in 2019. Being competitive as a freshman hinges on two things – being coachable (some players need a couple of seasons to realize they aren’t as ready for college as they thought) and playing hard. All four freshmen give full effort. As Warlick said, they are still learning exactly where to go on the court, especially in some of the defensive schemes, but they will get there in a hurry. Warlick really likes this group – but she will also get after them when needed. So far, the freshmen have responded well. Can you briefly discuss each of the newcomers? Rae Burrell. Photo courtesy of Tennessee Athletics. Rae Burrell plays hard every second that she is on the court. She can get to the rim and knock down a three. She also will crash the glass. Burrell is the only freshman who wasn’t named an All-American, though she was a nominee for the McDonald’s game. Burrell didn’t receive the attention before college that her fellow freshmen did, but she already has shown that she belongs at this level. The 6-1 wing is rangy and athletic. She also has joie de vivre that has made her a crowd favorite already. Mimi Collins has a Nicky Anosike-level intensity to her approach. She rarely changes facial expressions on the court and believes she has a shot at any rebound. Collins also will hit her free throws, which bodes well to have her on the floor in the closing minutes in close games. She wanted to get to campus as soon as she could, because she knows the opportunity is there to contribute in her freshman season. Collins will earn plenty of playing time this season. Zarielle “Zaay” Green, a 6-0 guard, is one of the most advanced defenders to enter college. She gets in a stance, moves her feet and does not reach with her hands. Green is fundamentally sound on defense and has clearly been well-coached prior to arriving to college. (Both of her parents, Zoderick Green and Yolanda Harris were outstanding college basketball players – Central Oklahoma for her father and Stephen F. Austin for her mother.) When Davis missed the second game of the season to rest a foot injury, Green seamlessly moved into the starting lineup. Green has the ability to be an All-American in college. Jazmine Massegill. Photo courtesy of Tennessee Athletics. Jazmine Massengill, a 6-0 guard (all of the newcomers are at least 6 feet tall) is the backup point guard and has acquitted herself well for one so young. She also is aggressive to the glass, despite attacking from the point position, and has averaged 5.7 boards so far. Massengill is second on team with eight steals (Westbrook also has eight) and while she is a pass-first point guard, she also can attack the basket. She is also unselfish. 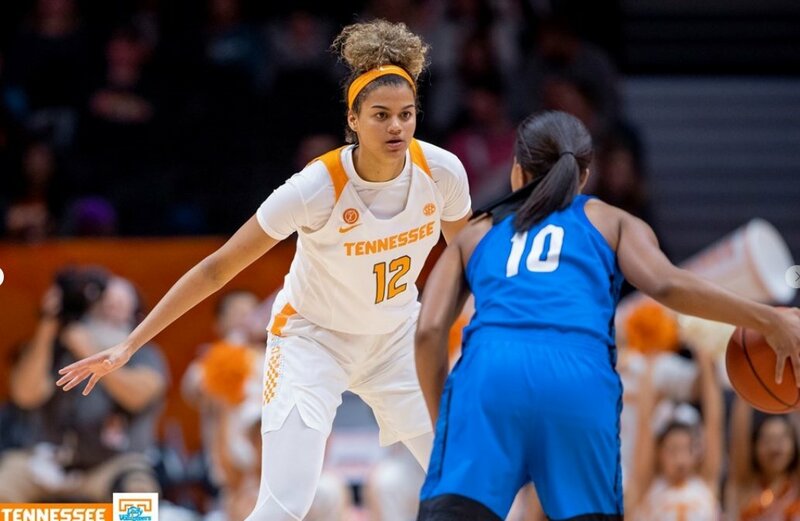 She hosted elite 2019 recruit Jordan Horston and was a factor in Horston picking Tennessee despite the fact they will compete for playing time. Which brings us to team chemistry. How is team chemistry coming along? So far, it is one of the best mixes I have seen since I started covering the team in 1998. The players genuinely cheer for each other, push each other and get along off the court. Despite their pick-up battles all summer – this is also a team that gets in the gym – when the game was over, they went to eat together. 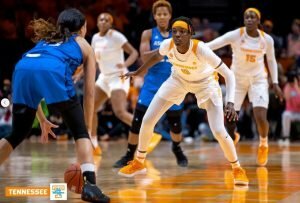 It is a team that seems aware of its role in bringing Tennessee back to where it belongs: getting to a Final Four and competing for national titles. Warlick has said it is a team that does not care who gets the credit, as long as Tennessee gets the win. If that attitude holds, the Lady Vols have a chance to be special this season. While their young lineup doesn’t make them a favorite to get to the Final Four, Tennessee will compete this season. That also hinges on good health. Tennessee already lost Lou Brown and can’t afford to take any more hits, especially with its commitment to get after it defensively for 94 feet. Rennia Davis. Photo courtesy of Tennessee Athletics. How will this team compete in the SEC? How far can they go? Tennessee can compete for the conference crown, though Mississippi State and the 6-7 Teaira McCowan present quite an obstacle. The Lady Vols need to finish among the top four for better postseason seeding in both the SEC and NCAA tourneys. Had they not lost to Alabama last season, Tennessee would have finished second in the SEC instead of a four-way tie for fourth place and a No. 7 seed in the SEC tourney because of tiebreakers. While this team will take some hits (the schedule gets a lot tougher and the SEC is a physical grind and an athletic conference) lack of effort should not be a causative factor in outcomes. Tennessee was picked in the preseason to finish third in the SEC – behind Mississippi State and South Carolina. There is a long way to go between now and March, but the Lady Vols have shown that they will compete. What happens when an opponent hits back? The response will set the tone for a young crew. Right now, Warlick and staff like what they see.